Mane, as a true impressionist, tried to fix the event, as if on the fly. And here, on this canvas, we are faced with a conversation between two people – a young girl and a little man in years. The conversation does not seem to be easy. You make sure of this when you look into the face of a girl. It is haughty and capricious, she apparently made some kind of decision, which is clearly not for the man. Most likely, between them was love. She was fleeting, impetuous and burned all her strength. But over time, probably short enough, the girl lost interest in an elegant man. Maybe even, most likely, she just wanted more, and the man was not ready to spend money. This led to the decision of the girl to leave. The fact that a girl loves chic, but not brightly dressed says her outfit. And the fact that the man is a bit stingy, but at the same time watching himself – also says his clothes. The conversation between them clearly came to a standstill, and there are simply no words to say anything. Parting is inevitable. Cloth simply extraordinarily meaningful. Moreover, Mane needs to know in order to understand why he put these two in the greenhouse. It’s simple: Mane loved to portray flowers. In general, he believed that of all that the Creator created, flowers are the best decoration of human life on sinful earth. And the artist sketched or depicted flowers on almost all his canvases, as well as in sketchbooks. Yes, with such care that sometimes I could not believe that it was just a drawing. Here and on this canvas, this couple is surrounded by a beautiful view of greenhouse flowers. Ferns and palm trees, beautifully make out the background of a sad conversation. At least something in this canvas pleases. 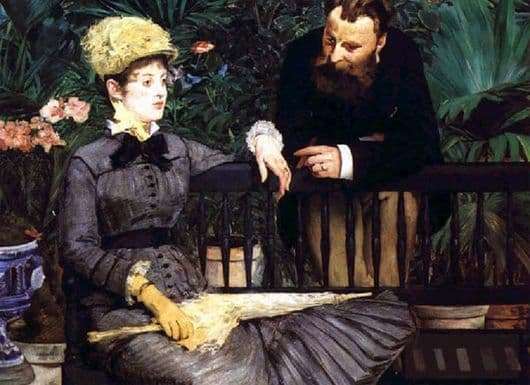 Manet invites us to reflect on the plot and even dream up what they say and what they think. The details are spelled out so vividly and clearly that you are amazed.